FOR the first time ever, the PBAPC (Philippine Basketball Association Press Corps) is handing out a Game of the Season honor during the 24th staging of its Annual Awards Night this Thursday at the Gloria Maris Restaurant inside the Gateway Mall in Cubao. The ‘Manila Classico’ duel between Barangay Ginebra and Star in the last Governors Cup was chosen by the group which regularly covers the PBA beat, as the first recipient of the award honoring the most memorable and best played game of the year. The match took place in the elimination round on Sept. 3 at the Smart Araneta Coliseum. The Kings beat the Hotshots in overtime, 105-101, after 29 lead changes and 16 deadlocks. Import Malcolm Hill sent the game into extra period after sinking three pressure-packed free throws with 0.6 tenths of a second left to tie the score at 95-all. 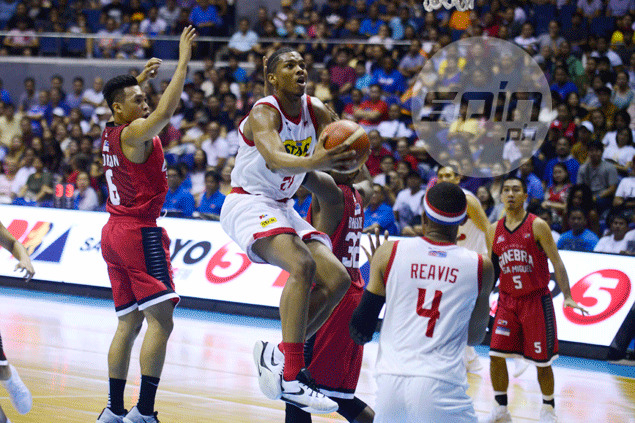 Japeth Aguilar, who fouled Hill while attempting a three-pointer and Ginebra leading, 95-92, atoned for the miscue when he followed up a missed basket by Justine Brownlee in the waning seconds of overtime to clinch the win for the Kings and secure a playoff spot in the season-ending tournament. Other games considered for the award include Game Two of the Philippine Cup finals between San Miguel and Barangay Ginebra, which the Kings won in overtime, 124-118, Game Three of the Commissioner’s Cup semifinals between the Beermen and Hotshots which Marcio Lassiter won for his team behind a huge three-pointer at the buzzer, 111,110. and the Phoenix-Alaska Governors Cup elimination round outing which the Fuel Masters won on import Eugene Phelps basket at the buzzer, 95-93. The Game of the Season is one of 10 awards to be handed out during the formal gathering to be highlighted by the presentation of the Coach of the Year award being held in honor of the late great mentor Virgilio ‘Baby’ Dalupan. Another major award to be given is the Executive of the Year named in behalf of the amiable late Crispa team owner Danny Floro. Also sharing the limelight are Kelly Williams (William ‘Bogs’ Adornado Comeback Player of the Year), Chris Ross (Mighty Sports Defensive Player of the Year), and Jio Jalalon (Mr. Quality Minutes). Completing the list of awardees are Terrence Romeo (Mighty Sports Scoring Champion), LA Tenorio (Order of Merit), Roger Pogoy, Jalalon, Matthew Wright, Kevin Ferrer, and Reden Celda (All-Rookie team, and coach Tim Cone, Jayson Castro, Ranidel de Ocampo, Marc Pingris, Beau Belga, and Tenorio (All-Interview team). Also part of the program is the official launch of the PBAPC Facebook page.